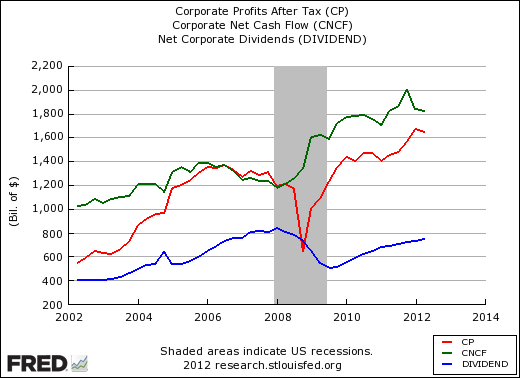 The Federal Reserve provides data on combined private and public company profits, cash flow and dividends, shown in this chart. 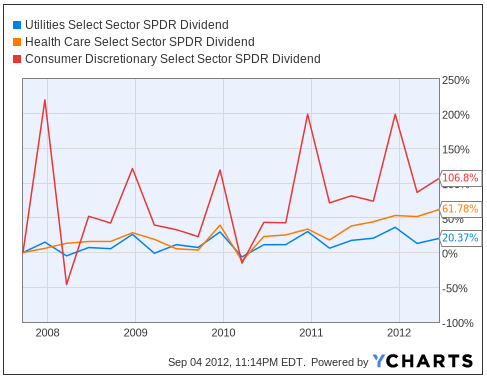 Profits and cash flow are well above pre-2008 levels and dividends are nearly fully recovered. Finances look good in the corporate world. 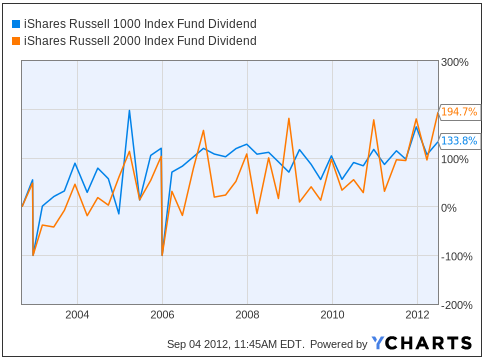 Looking only at dividends in investable ETFs, these charts from YCharts.com show the percentage change in dividends paid on IWB (for the Russell 1000 large-cap stocks) and IWM (for the Russell 2000 small-cap stocks) over 10 years, 5 years and 1 year. The small-cap stocks have much lower current yields, but have increased their dividends (from low starting points) at a significantly faster rate than large-cap stocks. 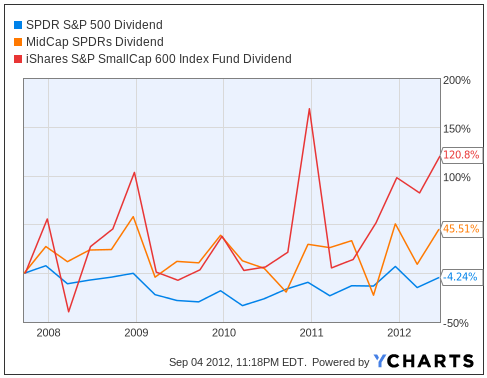 Both large-cap and small-cap dividends rose over each period, but 1000 large-cap companies lagged inflation over the 5-year period (some selectivity could have eliminated that problem). 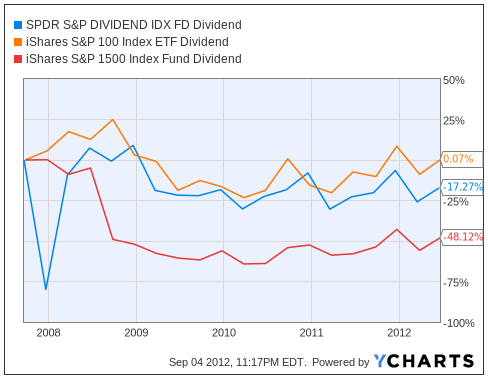 Note that the S&P 1500 Dividend Aristocrats have experienced a reduction of 17% in dividends paid over the past 5 years. This is the result of two factors. First, banks which were historically members of the Aristocrats index, were virtually all eliminated in the 2008. 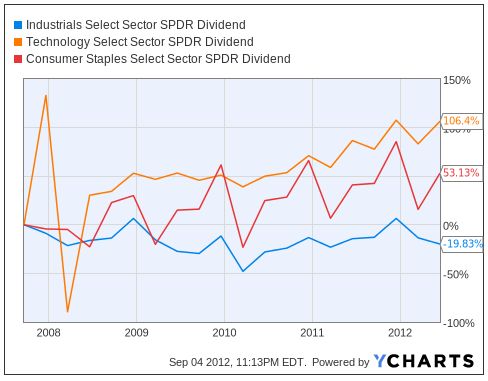 They were substantial dividend payers, and were replaced on average with stocks with lower yields. 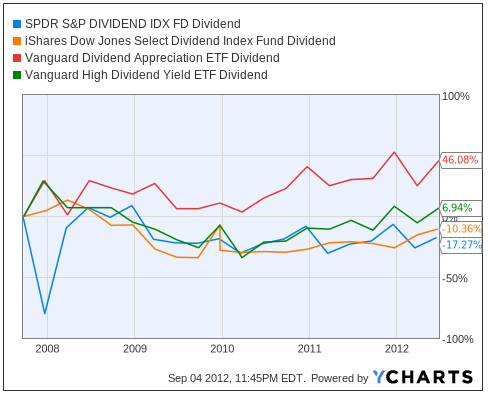 Second, the nature of the Aristocrats index is not yield focused, but rather is focused on dividend payment consistency. 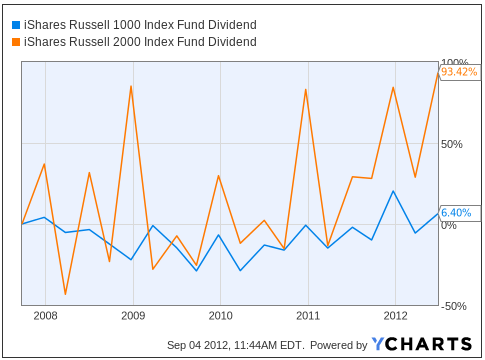 The index requires 25 years of back-to-back dividend payments without missing any, and increasing each year. That rule does not necessarily lead to higher yields, and when former high yielding payers like banks dropped out, their replacements while consistent did not pay as much. This and every post on this blog is subject to our general disclaimer. 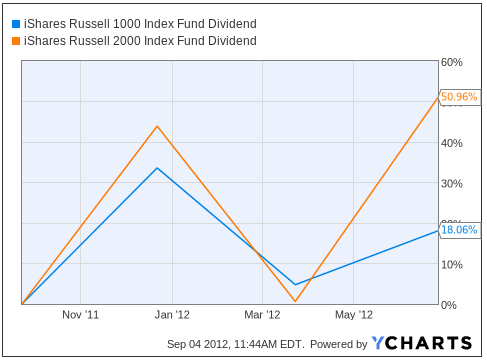 As of the date of this post (September 4, 2012), we have positions in IWM. 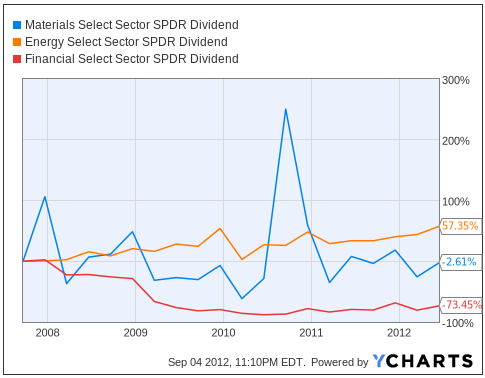 This entry was posted on Wednesday, September 5th, 2012 at 12:11 AM and is filed under Data, Interesting Charts. You can follow any responses to this entry through the RSS 2.0 feed. Both comments and pings are currently closed.